I have been living in New Jersey for 26 years and it still amazes me how little I know of the back roads of the Garden State. 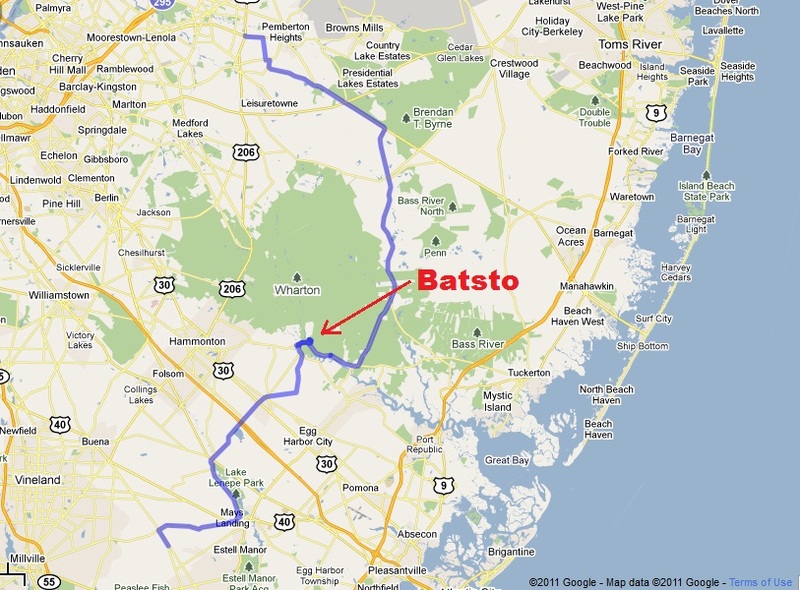 The southern part of New Jersey is pretty much flat with the Wharton State Forest in the middle. The park is the largest single tract of land in the state park system of New Jersey, it encompasses approximately 115,000 acres (470 km2) of the Pinelands. Three Sundays ago, my friend Wayne invites me to meet him and a few other riders for breakfast at the Vincent Dinner and then follow him for a ride through the Pinelands. It was a beautiful day, I didn't have anything to do but my wife would disagree with me on that, and I needed to clear my brain so I left the house around 9 to meet him at 10. We leave the dinner and head south crossing the park as shown on the map. I didn't have a chance to take any pictures but I promise I will ride alone through the park one of these days and will take lots of pictures. Our first stop was at the Batsto Village, a historic site located in Wharton State Forest in the south central Pine Barrens, and a part of the Pinelands National Reserve. I had no idea the place even existed, so thanks to Wayne for taking me there. In 1766, Charles Read, a well-known ironmaster, built the Batsto Iron Works along the Batsto River on the site of the future village. The area had an abundance of bog ore which could be mined from the area's streams and rivers, and wood from the area's forests was harvested for charcoal for smelting the ore. The rivers, despite their modest drop, were also harnessed for iron making. In 1773, John Cox bought the Iron Works, which produced cooking pots, kettles, and other household items. 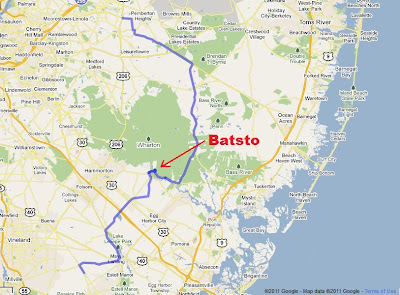 Batsto manufactured supplies for the Continental Army during the American Revolutionary War. The Batsto Village has over forty structures including the Batsto mansion, a sawmill, a 19th century ore boat, a charcoal kiln, a carriage house and stable, a blacksmith and wheelwright shop. The Post Office is still in operation, and collectors have stamps hand-cancelled, with no zip code. I walk around the village visiting some of the open buildings and admiring how hard life must have been back then. No electricity, no TV, no "internet", oh my goodness, what did people do at night? Some of the other buildings, all very well maintained. One last picture before I leave the village, the rest of the group was anxious, this was supposed to be a ride and not a sight seeing tour, but I love to take pictures and share with my fellow national and international readers. We continue south and make the next stop at the L's Restaurant and J Bones Tavern for a quick lunch. The Burgers were good and the atmosphere was friendly. I will be back. Next we make a stop for gas, the Triumphs have smaller gas tanks than my bike. I didn't need gas but since there has been talk on the blog-sphere about gas prices I took a picture to show what we were paying on April 3rd. It has gone way up since then but we still have the cheapest gas in the country. At this point some of the riders decided to break up and head home, it was left to Wayne and myself to continue the ride in South Jersey. We head towards Egg Harbor City and make our next stop at the Renault Winery. I had no idea we had one of the oldest winery in the country, I was amazed that my good friend Wayne knew about it, makes me wonder how he knows these places. Nearly a century and a half old, Renault Winery is a recognized New Jersey State Historical site and one of the oldest continuously operating wineries in the United States. The place is also a resort with a couple of restaurants, a golf course and the Tuscany House Hotel. They offer Sunday Brunch, I guess I will have to go back again to taste some of the local wine. We leave the winery and make the next stop at a small fishing village that seemed abandoned. I'm not exactly sure where it's located since my route recorder on my Android phone had decided to stop recording. I should know better to never trust technology, I guess next time I will take notes too. At this point it was getting late and I had told my mom I would stop by her house. As we were about to leave I spot the turtle sign on the lonely road leading to the fishing village. Interesting, how come the turtles only cross the road from May through August? must be another New Jersey mystery just like the Jersey Devil. I had dinner at my mom's house and then headed home covering a little over 200 miles. So much to see, so little time. btw, any news on the Tenere? 'Tis almost May! I have learnt a little bit of American History today. Good read George. Now when does that Tenere arrive? Batsto is a Gem. Lots of historic stuff there and thank you for the photos, even though you held the group up. I also like to ride and explore, NOT just ride all the time. and . . . where is the S10 ? any news yet ? 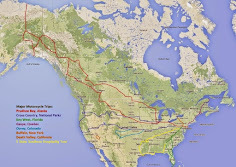 Same here, I keep learning about American history everywhere I go too, I always go to Wikipedia for more research, it's amazing how much info it's already on Wikipedia. I also like to take my time but when riding in a group one has to respect the group priorities :-( To ride just for the ride is great if you have beautiful scenery all around you but that doesn't happen that often though. I believe the evenings used to be spent with books. I still spend my evening with a book. It props my monitor up to the exact height I need. I like exploring too and the Batsto Village looks real nice! There are interesting things to see in NJ but the central part is like you said "industrial waste land"